Tobacco was a key product in the economical empire created by the founder of the General Tobacco Company of the Philippines, the first Marquis of Comillas. An enterprising grout which would dominate many sectors, the Tobacco Company also played an important role in the palace intrigues in the royal courts of the kings Alfonso XII and Alfonso XIII. In this novel we also learn about the family relationships between such as the Catalan poet and family priest, Jacint Verdaguer, and the famous Catalan architect Antoni Gaudí, who designed many of the Marquis buildings and his his son-in-law, Eugeni Güell's, works. 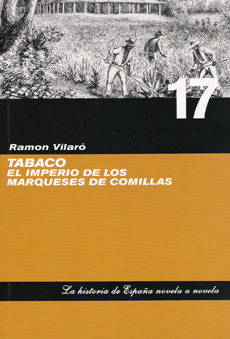 Tabaco is the story of the rise and fall of the Comillas empire, with a background of religious beliefs, family quarrels and passionate love affairs, at the time of the independence of the Philippines and, eventually, the loss of the last Spanish colonies. The story of life and economic miracles of Comillas Vilaró has presented the importance of refreshing memories. In literary achieved, the stage is located in the vicinity of the Marquis of Comillas, making the work on a biography of his company was more highlights Tobacco Company of the Philippines. Covering guerrillas and coups in half the planet, the curious Ramon Vilaró novel was hungry. Now published Tobacco, the rule of the Marquis of Comillas, owners Tobacco Company of the Philippines. It tells the story of a family that dominated sectors such as banking, mining and trade of snuff. It accurately describes the arrival and development of the tobacco industry in Spain. The novel, widely documented, focuses on the upswing, when Lopez represented the intimate relationship of money and politics. The reader will enjoy a romantic story with echoes of the nascent industrialization and the decline of the colonies. Center the narrations, rigorous in historics, his the life of the marquis of Comillas.